There is a pain that lingers deep inside of me that sometimes surfaces to make for very dark days. Tuesday is the day of this particular week that I feel quite out of place. It’s a day I ask myself did I make the right decision to expose my feelings to the world to pick apart at their leisure. Did I make the right decision to fight for change amongst a world that to often rejects it at every turn. It is days like Tuesday that can sometimes surface on a Monday or maybe even a Sunday. Unfortunately these emotions don’t give warnings they just appear. It could be something as simple as a child’s laughter or a woman I pass and I can feel she’s having a hard time, whatever the trigger may be on that day it sends a barrel of emotions all over the place and it’s up to me to pick up the pieces. My Life has become a puzzle that only I know the pieces that fit together. There are so often these times of working in maternal mental health from the loss perspective that I feel alone. An extraordinary story I have which makes to sometimes feel like isolation. It’s the questions I ask myself where do I fit? Who else is just like me? Mis-Counted and fighting to feel like I Still-Matter. I didn’t choose to deliver my daughter stillborn but it is the outcome that I will forever live with. She became my story and she has forced me in her death to realize what is happening to many women around the world. Just as I didn’t talk about how I was feeling because I didn’t know myself, there are other women experiencing the same hold back. On the other hand now that I’m talking it feels like it falls on deaf ears leading me to feel as if my message is not being heard. I’m questioning myself what must I say what must I do to get your attention. There is an entire culture of women and children dying to live. 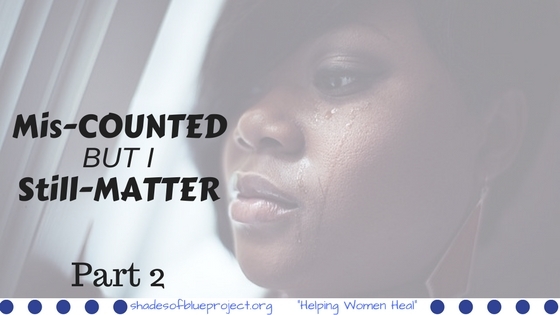 African American women in just Texas alone are dying at 3 times higher rates than any other race and African American children are dying at 2.5 times the rate than any other race. If you add that along with the maternal mental health issues that go unaddressed the world undeniable has a catastrophic problem on our hands. At this point I am simply fighting to be seen so that I can be heard. I am a black woman who is fighting to make change happen amongst a dying culture. It is not just me it is others who need to know that this is a form of epidemic outbreak and it has to stop. I ask that you help me to help others. Embrace my words; embrace my true emotions in the plight for change. Spread the word so that I can reach more women who are looking for the voice that says what they need to here so that they too can come out of the darkness and start the road to recovery. Whether you are a woman who has loss a baby or a woman who has 1 or more children we are all mothers just the same. It’s time that the Mis-Counted feel like they Still-Matter.